Loudspeaker design philosophy by AUDIO "F"
Testing the F3 in an anechoic chamber. A loudspeaker can be constructed in hundredths of configurations, but to achieve true excellence technical engineering skills are never enough. There has to be a vision, a philosophy about all aspects of the design and construction process. 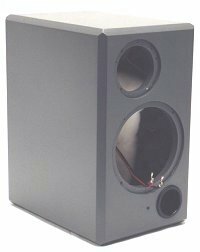 All loudspeaker enclosures are made of medium density fibreboard (MDF). All loudspeaker enclosures are constructed to minimise standing wave effects inside the enclosure. The loudspeaker enclosure has special chamfered corners to minimise edge diffraction effects in the amplitude vs. frequency curve. Every speaker driver is milled into the enclosure's front, to eliminate edge diffraction effects generated by the driver itself. Drive units are chosen for highest sound quality regardless anything else. All woofers have a special mineral filled polycone, these are superior to (coated) paper cones in both distortion and life aspects. All tweeters have a special coated woven dome, most metal dome tweeters resonate just above the audible range thus giving some distortion. We always make use of active crossovers. Low level active crossovers give stable performance even in high power applications. 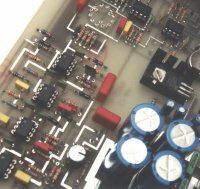 The crossover amplitude and phase responses are optimised to achieve highly accurate system performance. Each driver in a multiway system is powered by its own amplifier. All systems are equipped with room response adjustments. We make use of the industry's standard MLSSA measurement equipment. The importance of our extensive listening tests is always higher than a MLSSA measurement. Learn more about MLSSA at www.mlssa.com.